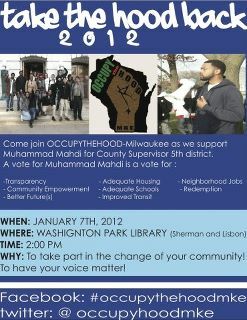 Come join Occupy The Hood as we support Muhammad Mahdi for Country Supervisor 5th District (Milwaukee). 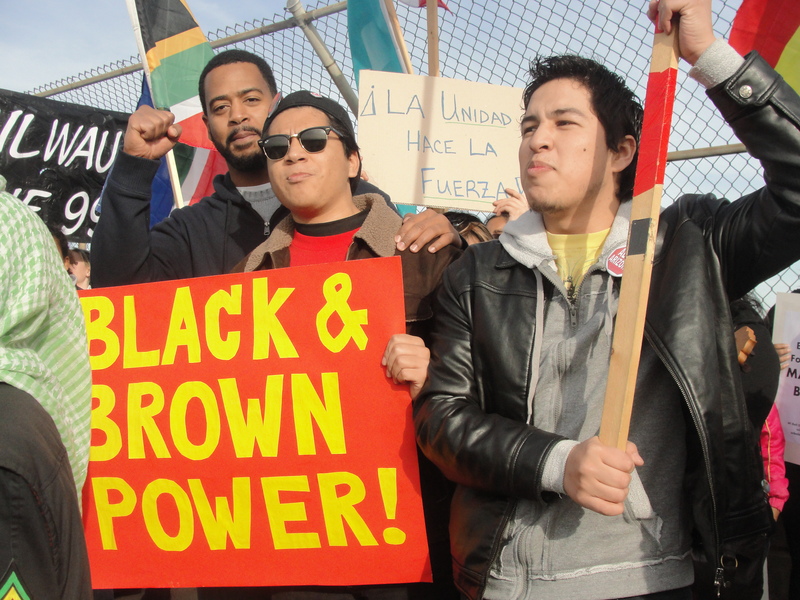 Mr. Mahdi (with fist) participating in a 'Black & Brown' unity march Nov. 12, 2011, Milwaukee. 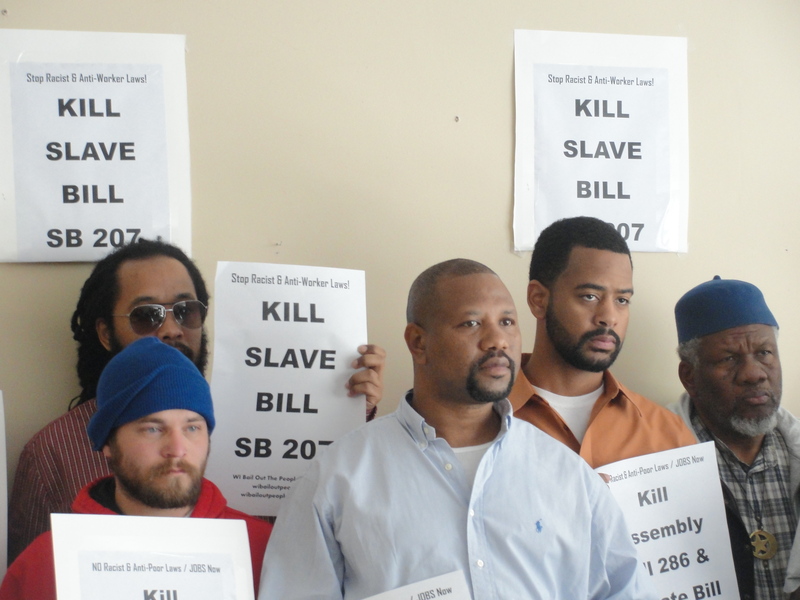 Mr. Mahdi participating in a 'Kill SB 207 Bill' Milwaukee press conference sponsored by Occupy The Hood Oct. 28, 2011.
scheduled for May 23-27, 2012 .
you in advance.We the residents of Benton Harbor love you! Join transit advocates, concerned residents, unions and community leaders for a rally to save our transit system. Jan. 14, 2012, 1 p.m.
Protesting transit cuts at Summerfest in Milwaukee July 2011. UPDATE, Jan. 4: Bryan, Andy, their attorney and & other supporters went to court today. There has been an adjournment for the trial until Thursday, Feb. 16 at 1:30 p.m. We hope to see you then. Thanks much to all those who came out to support us today. We are now mobilizing to pack the court on Feb. 16. Updates available at: www.wibailoutpeople.org. We also need contributions for the defense campaign, you can go to the website and click on the Paypal button, everything helps. Thanks again & Solidarity Forever! 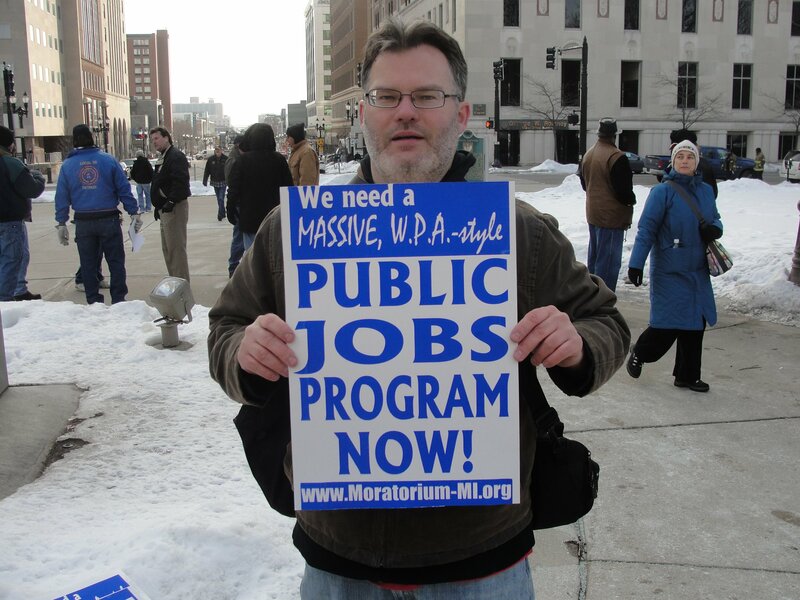 “Bryan Pfeifer is being targeted for political repression and criminalized because of his persistent organizing against the reactionary Governor Walker who is attempting to outlaw labor unions in Wisconsin. Bryan is also known for his persistent anti-racist opposition to war and repression. He works tirelessly to organize in solidarity with the Anti-War 24 who were raided or subpoenaed by the FBI, including Carlos Montes now facing phony felony charges in Los Angeles. We call on you to support Bryan Pfeifer and all those struggling to build a better society! Wednesday, Jan. 4, 1 p.m. Ask clerk what court Pfeifer’s case will be heard in. Donations are urgently needed to defray costs of the defense campaign, Use Paypal button at: http://www.wibailoutpeople.org. On right hand column on this page. Andy Andre (Legal Name: Ljubomir Andrijasevic), a longtime progressive political activist and Bryan G. Pfeifer, a Wisconsin Bail Out The People Movement (WI BOPM) organizer and an independent journalist, are appealing to supporters pack the court for Pfeifer’s judge trial Jan. 4, 2012. Bryan and Andy were arrested August 26, 2011 while protesting Scott Walker’s appearance at Messmer school in the Riverwest neighborhood in Milwaukee. Both were charged with one municipal citation each of Resisting/Obstructing an Officer. The city claims it has ‘lost’ Andre’s ticket and has up to two years to issue him another one. Andy and Bryan are fighting these bogus charges because they are an attempt to put a chill on the entire progressive political movement in Wisconsin and beyond. 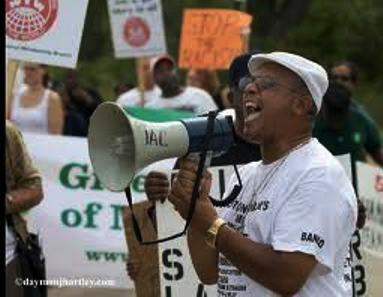 These charges are also an attempt to stop those fighting racism, police harassment and brutality, union-busting and other austerity measures on poor and working people. We will not be silenced! We will not allow our constitutional rights to be taken away! Protesting Scott Walker and other politicians’ attacking poor and working people are not crimes! The WI BOPM thanks supporters who are already helping on this campaign. We still need your help and many others. A victory in this campaign will be a victory for everyone in the progressive movement. If you can help with fundraisers or other activities please contact us. PACK THE COURT JAN. 4, 2012!! “It is with great honor that I add my name in support of one of the most progressive voices crying out for the redemption of the forgotten and exploited masses, Bryan Pfeifer. I have known this man for more than ten years as both a student of mine and an organizer for the upliftment of the oppressed masses whether they are workers or unemployed. His voice has resounded on the campus of UW-Milwaukee and in the community of Milwaukee in support of the rights of the exploited and oppressed. We have a history of working on the campus and in the community together. We were on campus in the support of the rights of the custodial workers at UWM. Recently we worked together on the rally against the “Nazi” protest here in Milwaukee. I can attest to the righteous and unselfish character of this young man. He has been a persistent and consistent freedom fighter for the rights of exploited and oppressed regardless of their cultural reality… He is a person who comes to a space and rolls up his sleeves and begins to organize and carry out the tasks that help to educate the forgotten of their rights to a decent quality of life… He is not selfish with his skills as he quickly reaches out to help youths to understand their responsibility to make this a better world. 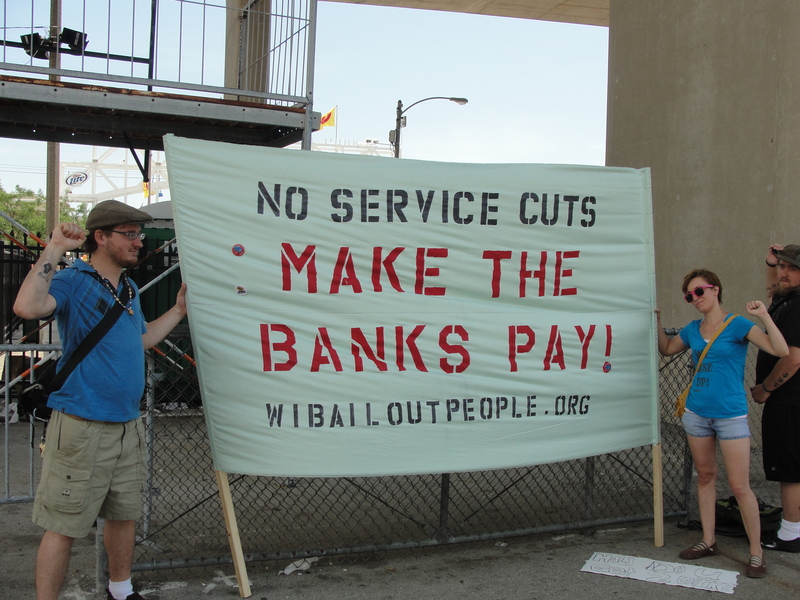 Bryan G. Pfeifer, Organizer, WI Bail Out The People Movement and independent journalist.